If you’re like lots of people—including me—you’d love to hang your flat-screen TV on the wall. But then you think about relocating the electrical outlet, and dealing with the speakers, and finding a spot for the streaming box, and hiding all the cables, and so on and so forth. So the TV never gets off whatever piece of furniture it’s been resting on. You’re the person Sonos built its new Playbase speaker for, and for whom Sanus built its Swiveling TV Base for Playbase. The stand is designed to make it look as though your TV is hanging on the wall and floating above either a Sonos Playbar or the new Sonos Playbase. 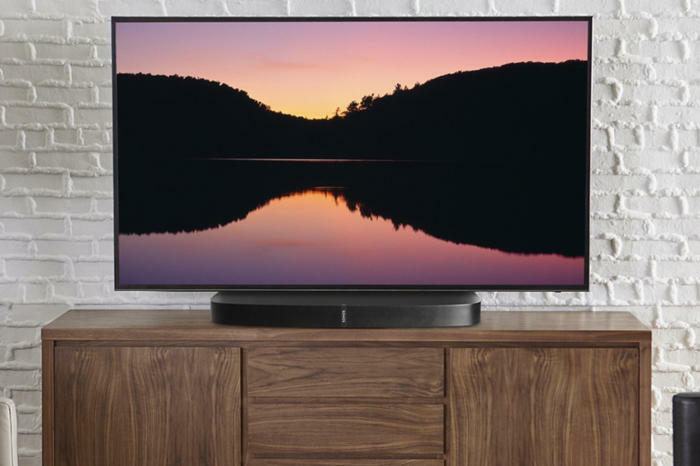 But it neatly avoids all the hassle associated with that endeavor and it allows you to swivel your TV 20 degrees left or right and tilt it up to 5 degrees—actions that only more-expensive wall mounts are capable of. But you don’t need to own a Sonos speaker to appreciate this well-built TV stand. You can also use the up to 8 inches of vertical space between the stand’s “foot” and the bottom of your TV to stash your cable box, A/V receiver, or any other piece of gear. Don't be intimidated by the number of nuts and bolts; you won't need most of them. I was initially intimidated by the prospect of assembling the Sanus when I opened the box and saw its component parts—especially the bandolier of plastic bags containing dozens upon dozens of bolts, nuts, washers, and spacers. I felt much better after reading the instructions and learning that I wouldn’t need most of them. It’s usually a bad sign when you build something from a kit and have parts left over, but Sanus had to account for many, many TV designs—different weights, different shapes and thicknesses, curved screens, flat screens, and so on—so they needed to provide lots of fasteners to cover every contingency. 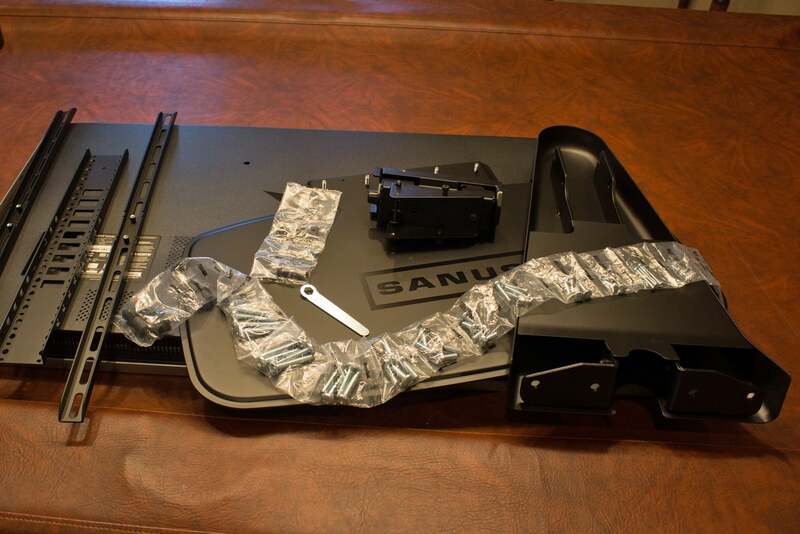 It’s a shame that you have to pay for so much hardware when you’ll need only a few pieces, but Sanus’ approach is far more cost efficient than having a different SKU for every model of TV. The stand, incidentally, can support TVs ranging from 32- to 60 inches and weighing up to 60 pounds. 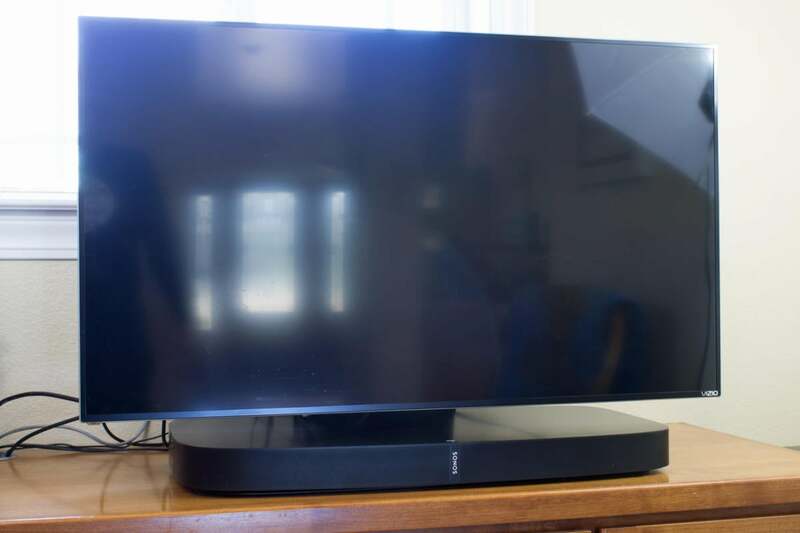 The Sanus WSTV1 Swiveling TV stand is designed to make your TV look as though it's floating above a Sonos Playbase (shown here) or a Sonos Playbar. The well-written and illustrated user manual made the task easy, and I had the stand assembled in no time with just a Philips screwdriver and the provided hex-head wrench (you’ll need to provide your own screwdriver). The most difficult step was lifting the TV and hanging it on the stand. Even though my TV is small at 43 inches and relatively light (22.05 pounds without its stand), I couldn’t peer over it to see exactly what I was doing, and had to rely on feel to know when the hook on the bracket had engaged its counterpart on the stand’s pivoting head. You’ll want to enlist a helper if you’re dealing with a larger TV. Two sturdy lock screws secure the pivot to the stand, and two more secure the TV to the pivot. A cable cover built into the stand helps reduce cable clutter, but it assumes you’ll be routing your coax and power cables directly behind the stand. My TV rests on a desk in my kitchen, and the cables drop through a cable grommet on the left-hand side, so that design didn’t work as intended for me. I did appreciate the ability to swivel the TV left or right, though; with the TV being in the kitchen, I was constantly lifting it up to move it into a better position relative to where I was watching it from (behind the stove, sitting at the breakfast bar, or sitting on the bench opposite). I didn’t have a Playbar to evaluate the TV stand with, but the Playbase looked good and sounded great with it. The floating idea works. This TV stand is terrific whether or not you use it with a Sonos speaker.